All of my work, whether they are paintings, installations or public art projects are all created with the specific intention of educating and enlightening the viewer. At its very core, art must transgress if not completely shatter boundaries, within both the viewing audience as a whole, and inside the individual viewer as well. To achieve this, I focus on where the project will be located and who will be looking at it and take into consideration how I need to communicate through my work to that audience. Beauty and pleasing aesthetics catch the eye. Cross-cultural references and archetypes trigger the innate response to symbolisms, while color, pattern and intricacy appeal to the emotions, all of which hail to someone’s attention, inviting them to linger at the work for longer than just a glance. It opens them momentarily, giving them subliminal glimpses of our universal eternal spirit. Once we establish a common ground, we can begin to appreciate the countless differences that make us all unique, respecting the great complexity and diversity of our fellow human kind. 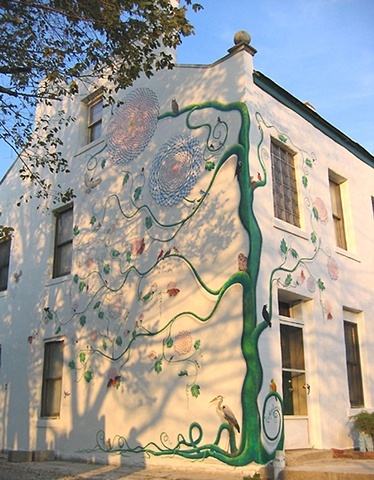 In the fall of 2006, I was commissioned to paint a three-story mural in a transitional neighborhood around Cleveland. I decided to make it site specific, painting our native birds to our migrating monarchs, frozen in interaction amongst the massive trompe l’oeil vine blooming giant mandala flowers. During the 7 weeks I painted, I got to know many of the locals in the neighborhood, from “Uncle” Bob the pimp with all of his “nieces,” the resident homeless guys, the local fire crew, and the new yuppie family that moved in down the street. Generally, these people didn’t interact with each other, but while I was working, “Uncle” Bob, the homeless guy with the bike, and the yuppie couple with their boxer puppy all stopped together to chat and admire what was going on. Almost every day, I witnessed the mural bring people together from all walks of life. We inadvertently set up a sacred space, creating a living mandala between the interactions of the viewers, myself and the mural similar to the energy created by a sand mandala, equally as ephemeral and impermanent.